From Broadway turn left heading east on PCH. 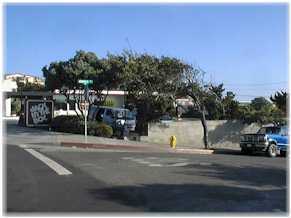 Brooks street is about a half a mile down PCH and the third street past the light at Thalia street. Brooks street is easy to get to once you pass Thalia street. The picture shows Brooks street and the building that you should look for to mark the right turn onto the street. You should have plenty of time to get over into the right hand lane to turn onto Brooks street, unless traffic is extremely heavy. If you get to the light at Cress street you've gone too far. Turn down Cress street and take the ally back to Brooks street. Parking at Brooks Street Beach is very limited as is seen in the picture. 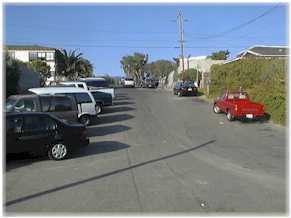 Brooks does have more parking spaces than most of the other beach access streets in this area. There are parking meters to pay, you feed them 1 quarter for each 15 minutes and there is a two hour limit before you are supposed to move your car. There is also an alley way on both sides of Brooks street and there may also be some parking available there. Please don't park in someone's driveway though. The Laguna Beach parking enforcement is one of the fastest and most efficient that I have ever seen. If you park in someone's driveway or you don't keep the meter fed and your car moved you will get a ticket. 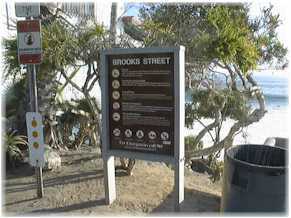 Beach Access at Brooks Street Beach is via 40 concrete steps down to the beach. 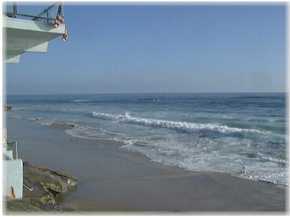 The beach area is very narrow along this section of coast in Laguna Beach. The picture shows just how high the water can be. The entire beach is covered as well as the bottom of the stairs. As you can see, be sure that you put any belongings way up high on the shore if the tide is on the rise. When I got "hit" by the water I started to wonder if I was going to get back or be washed away! Facilities at Brooks Street Beach are only some trash cans and the bench area that are pictured here. The bench does make a nice area to watch those that are playing in the water. There are NO bathrooms or telephone available at this beach. Brooks Street Beach is a very popular surf area. There are even surf contests that are held at this beach. You will always find someone in the water here enjoying the waves that this beach offers. There are some exposed rocks on the far east side of the beach. 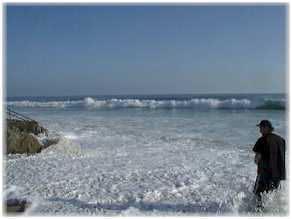 Most of the reefs in Laguna Beach run parallel with the shore. If the waves are small or better yet "non existent" this could be a great diving opportunity. Just remember that there could be surfers out there with "HARD" surf boards to get hit by, be careful!